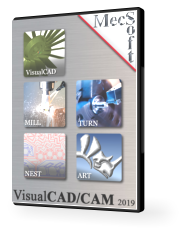 VisualCAM along with VisualCAD is MecSoft’s standalone CAD/CAM package that is considered the best valued CAD/CAM system on the market today. VisualCAM includes modules for MILL, TURN, NEST, and ART to address specific needs of various CNC manufacturing processes. NEST is a module within VisualCAD/CAM and is MecSoft’s cost effective solution for optimally arranging and fitting geometric shapes onto sheets of stock material. It provides two primary nesting capabilities: Rectangular Nesting and True Shape Nesting. For both solutions, individual 2D CAD shapes can be arranged on sheets according to user-defined quantities, spacing, and with orientation control, including material grain restrictions. For a complete feature list of product features, please visit the product page in our main site.